All who have had the privilege of hiking to the summit of Tall Hisban in Jordan can attest to its magnificent panoramic view. I have personally spent hours on top of this ancient ruin savoring its glorious vistas. Westward are the magnificent views of. Mount Nebo and the Jordan ­­­Valley, Jericho and the West Bank, Jerusalem and Ramallah. Northward, are the biblical tall of El Al and the Ammonite hill country. South and eastward are the fertile plains and verdant valleys that extend toward Madaba and the Moabite table land. 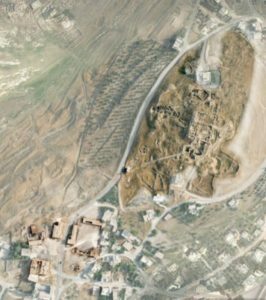 Google Earth view of the archaeological site of Tall Hisban and the Nabulsi stables and qasr. This multi-millennial tale of conquest by kings and emperors and of staunch survival by locals that is the “big story” of Tall Hisban is a story that many of you reading this post helped unearth as part of the original Heshbon Expedition led between 1968 and 1976 by Siegfried H. Horn, Roger Boraas and Lawrence T. Geraty, or as a member of the Phase II Tall Hisban Excavations led between 1997 and 2013 by myself and Bethany Walker, or as a sponsor-supporter of one of these expeditions. As you may already know, a short film about our current fieldwork and most recentefforts to narrate the “big story” of Tall Hisban can be found on YouTube and Vimeo – when you search for “Deep Time at Tall Hisban.” A complete list of all of our scholarly publications can be found at our web site. Stanley Beikmann and three of his landscape design students at work building a welcoming area near the entrance to the tall. As these farm buildings are now no longer being used by the family, the Nabulsis have offered to make them available to ourarchaeological team to lead out in restoring and turning them into a visitor center. Their stipulation is that, as far as possible, the buildings be restored to their original appearance using traditional building methods and that the activities that take place in these buildings will be a source of employment and income generation for the present-day residents of Hisban. To this end, Jason Blanzy and Martin Smith of the School of Architecture have drawn up a Master Plan laying out our vision for restoring the entire Nabulsi complex. Planning meeting with Dr. Safa Nabulsi in one of the heritage building belonging to his family. 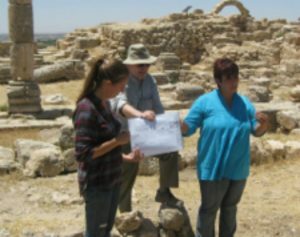 In fact, another key component of our strategy for implementing this master plan is the Jordan Field School which will continue to bring Andrews professors and students to Jordan on an annual basis to work with the local craftsmen and their apprentices in doing restoration work, and to assist with preparing and installing exhibits for the various buildings. 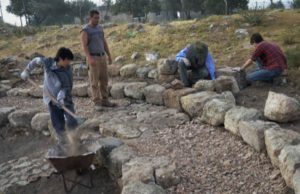 To this end, Jason Blanzy has been appointed to serve as project manager in charge of overseeing the work of the master craftsmen and their apprentices and for preparing for the work to be done by the students from Andrews during our field season. In 2014, it will take place from May 23 to June 16. 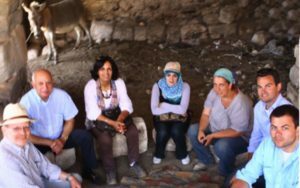 Jason will work closely with Elena Ronza, co-director of the Hisban Cultural Heritage Project. 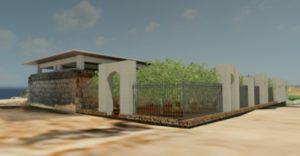 To facilitate giving to the Hisban Planned Giving Project we have set up a special fund through Andrews’ Office of Development called the Hisban Legacy Fund that will enable you to receive tax credit for any and all contributions to this project. It is also possible to send a personal check or a registered check to: Hisban Legacy Fund, c/o Donor Records Administrator, Office of Development, Andrews University, Berrien Springs, MI 49104.